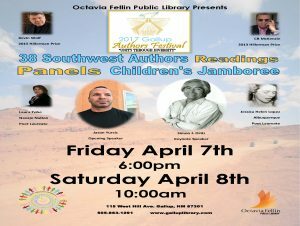 Friday April 7th starting at 6:00 pm and running through Saturday April 8th, 4:00 pm, Octavia Fellin Library will be hosting the 2017 Gallup Authors Festival – Unity through Diversity. This year’s festival will host 38 southwest authors, including Simon Ortiz, Jason Yurcic, Laura Tohe, CB McKenzie, Mark Rudd and Evangeline Parsons Yazzie. Authors will be available throughout the festival to discuss their works and sign books. The opening reception at 6:00 pm, April 7th will feature a reading and discussion by Jason Yurcic, author of Voices of my Heart, Odes to Anger, and Word Son. Yurcic is a poet with roots in Gallup and has had a lifetime of experience which he draws upon to create his poetry. He was the runner up of the New Mexico Book Award in 2007 and 2009. Simon Ortiz will give the festival’s keynote address at 1:00 pm. Mr. Ortiz has been writing for over 40 years and published 19 books that address topics of concern to Indigenous Americans. Hailing from the Acoma Pueblo, Mr. Ortiz has received many Lifetime Achievement Awards, International Awards, and was recognized at the Whitehouse as an honored poet. Following the keynote address at 1:30 pm, Hillerman Prize Winners Kevin Wolf and C.B. McKenzie will speak. Kevin Wolf author of The Homeplace is the 2015 winner of the Hillerman Prize and C.B. McKenzie author of Bad Country is the 2013 winner of the Hillerman Prize. They will have a discussion and book reading. Jeff Berg is the author of New Mexico Filmmaking, and has traveled the state showing clips from New Mexico films. At 10:45 am in the Main Library’s Meeting Room, he will present “Native Americans in NM Films”, a historical look at New Mexico films. Kenneth Seowtewa from the Zuni Pueblo will provide information about the Zuni Mural Project that he is working on at 11:00 am in the Library’s Southwest Room as well as talk about the article he wrote on the same subject. Nasario Garcia, author of Hoe, Heaven and Hell and 30 more titles including bilingual children’s books, will present “Stories of New Mexico’s Magic, Mystery and Suspense” at 11:30 am in the Main Library Meeting Room. Mr. Garcia’s latest books are all recent winners at the International Latino Book Awards, the 2016 NM/AZ Book Award for Children’s Bilingual Book, 2015 NM/AZ Book Award Best Book on New Mexico and many more. There will also be five Diversity Panel discussions at the Main Library. A Poetry panel will be held at 12:00 pm with Poet Laureate of the Navajo Nation Laura Tohe and the former Poet Laureate of Albuquerque Jessica Helen Lopez as well as Max Early, Dan Wetmore, Mariya Deykute, and Barbara Ruther in the Library’s Meeting Room. A Young Adult panel will be at 12:00 pm with Barbara Beasely Murphy, Amanda Strong, and Gail Wagner in the Library’s Southwest Room. At 2:00 pm, a Local panel that includes Ashley Gallegos, Andy Gibbons, Essie Yazzie, Martin Link, and John Taylor will be held in the Southwest Room. At 3:00 pm the final two panels will be held. First is Diversity in Fiction with RJ Mirabal, Larada Horner, Roberta Parry, Michael Hays, and Evangeline Parsons Yazzie will take place in the Library’s Meeting room. The other panel will be Diversity in Nonfiction with Barbe Awalt, Lori Robinson, Marion Amberg, Scott Carroll, Astrid Winegar, and Shelley Armitage will be held in the Southwest Room. Mark Rudd, author of Underground : my life with SDS and the Weathermen will give a presentation titled “Tales from the Underground” at 2:15 pm in the Main Library meeting room. The Children’s Branch will host a special Children’s Jamboree, beginning with a special presentation by author Ross Van Dusen at 2:00 pm. Author of How the Crocka Dog Came to Be, Van Dusen will perform a reading of his award winning book followed by a children’s activity. At 2:30 pm, the Children’s Branch will host a reading of The Only Road by author Alexandra Diaz whose book was recognized as the 2017 Pura Belpre Honor Book. At 3:00 the Children’s Jamboree continues with authors Anita Poleahla, and Nasario Garcia who will be storytelling and helping with bookmaking projects for children. For more information please contact the library at (505) 863-1291 or email library@gallupnm.gov.